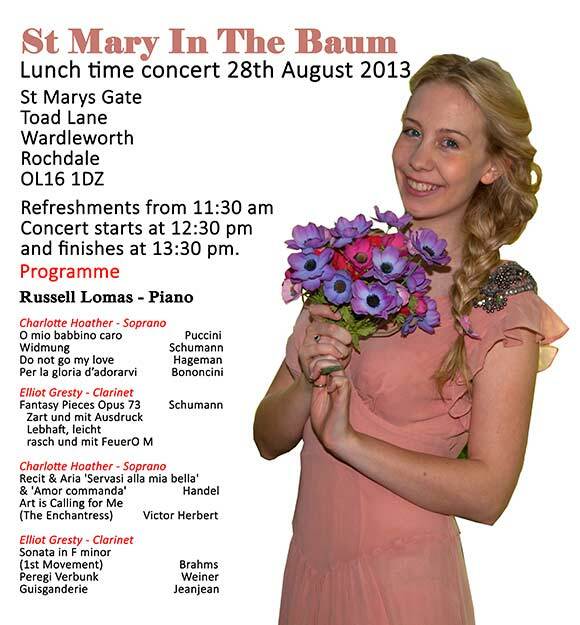 When I get back on Wednesday I will be performing in the last of my summer concerts for this year, in Rochdale. I love to perform in these church venues as the audiences are so receptive and the acoustics are great for a live performance. Russell Lomas is a fantastic accompanist to work with and helped me to understand how to prepare for and get the best from these concerts and I would like to thank him for all of his hard work and guidance. The programme looks great, hope the concert goes well. Thanks Marcus, it’ll be my last concert with Russell this year and I’m looking forward to it. He’s been a great help practising my songs with me over the summer. See you soon. I wish that I could attend this performance. You have great talent and skill, and you also seem like a truly delightful person. I hope that you’ll knock it out of the park–a very American phrase, but I’m sure that you’ll understand it. And I’m also sure that you’ll wow your listeners. I’m looking forward to your tour of the States. Please include Minneapolis on your agenda! Hi Dan, thanks for checking back in on me, I used to watch lots of Friends, Big Bang Theory, Suborgatory, lots of American sitcoms so I understand lots of phrasing – so thank you very much, I love it when I nail it (there’s an English expression for you :). Best wishes with your concert, Charlotte. I am sure you will be wonderful as usual. You are so talented, truly a gift from Heaven. Thanks Janice I appreciate your continued support. Your concert will be amazing! Hopefully there will be pictures! Best of luck with your studies. Thanks Koko lovely to hear from you again, I passed your blog on to my elder brother as I said on your site because he’s on a real healthy eating regime now. Have a great semester at school! Thank you 🙂 it will be great catching up with my friends again and getting stuck into my studies and make up on lost time with Kath my singing teacher. I love that word ‘semester’ sounds more professional than ‘term’. I wish I could! Have a lovely time! I wish you could too, I love big audiences ;). Love your name Guenevere do you insist on the full name or let people shorten it?I always preferred Charlotte to Charlie, Lottie etc. I just listened to your recordings and your voice is stunning. Wishing you the very best luck with your concert and the coming school year. Oh my, you’ve just reminded me I have lots of laundry to do today! I’d rather sit and blog. Thank you for your lovely compliment and wishes of luck. Good luck and have a rocking concert!! Hi Izzy, thank you very much :). I’m working for the next three weeks after the bank holiday, then I’m taking a week off to move back to Scotland and hang out with friends, then I’m back to full time study yay. Hi Charlotte, all the best for your next term! Meanwhile, have lots of fun during your performance before going back to books again. Thank you for your best wishes, I’m looking forward to my final concert and Elliot is fabulous on clarinet I enjoyed putting on a show with him for the first time this year. Best of luck with the concert. You are obviously a talented lady hard working lady and I love nothing more than to see brains and hard work pay off. Best wishes. Thanks Cecilia, hope you’ve had a good summer too. 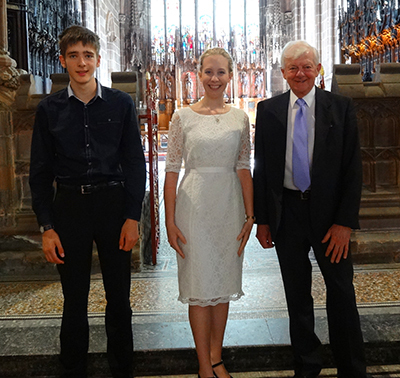 Best wishes for the concert – the programme looks great. Shame I’m so far from Rochdale – will be looking out for dates in London. I’d love to have dates in London :). I was there last week on holiday with my family, we had a great time, although now my brothers working in the City he laughed when we stayed in a hotel a stroll away from where he works! He still joined us ’cause he didn’t want to travel. Best of luck with the concert and with your studies! Thank you, I’m glad I found your blog it’s lovely. Hope you enjoy Autumn. Hey great programme Charlotte, all the best with this and your studies. Thanks Andy, I bought a big canvass from the Works for £14 to paint some art for my wall, I loved your snaps on Heartland, I did a bit of Aboriginal inspired art at school and it reminded me how brilliant it is. In the theater you say ‘Break a leg’. Is there a special good luck wish for concerts? Hi Michael, I don’t know about concerts, but for Opera they say ‘toi, toi, toi’. Thanks for your good luck message. Charlotte, good luck with your studies. I feel you do great! Hello Charlotte, that s awesome! Thank you for doing that. And certainly unexpected on my side, seen your interest. That is a nice surprise and shows you are a very intelligent person. 1) if you love psychology you will love trading. However if you are hooked and decide to learn more, please take the long path. Trading can give big satisfactions (when you are paid for the decision you make!) but takes time. Think like this: you will be an expert in 10 years. If you cannot take this long term view maybe trading is not for you (trading is not for everyone, but it may be for you! I hope). I wish you all the best about your studies (as Benjamin Franklin, the inventor and US foreground figure: “the investment in education is always the one offering the higher returns”), and I hope you will not stop to educate yourself a little, but rather continue to educate yourself a lot. I myself am a life learning chap. All the best, and chat to you soon. Hi Giuseppe, thanks for the information and the link to the e-book. I am no stranger to the long game. I like to see things through to a proper conclusion and if I find an obstacle then I will ask for help to find out how to overcome it so that I can continue. My brother is very Maths based having completed his Masters degree and is now studying for his Actuary qualifications. He is the one that I rope in to explain things to me when I need a practical viewpoint. Will she make it? Very probable, very much so. I had a friend back in my place in Italy who was a successful Soprano. I noticed the kind of work that goes into it. It is the work required to perfect any craft…..
One day you will be buying $250.00 concert dresses, or will just keep buying $50 concert dresses and give the remaining $200 in charity. I am sure your brother will make it (I always ask such a small and smaller number of people get involved with Math), and it was a good choice. How exciting to get to sing in such lovely places! Good luck getting back to your studies. It is a fabulous church; they even serve up pie (I think it was meat and potato) and mushy peas for lunch with cake and custard for afterwards, everyone cleared their plates so it must have been delicious, I couldn’t join in because they serve it before the concert. Thanks for your wishes of luck. Thank you for your nomination, I enjoyed your blog too especially your latest peace, love and daisy chains post. After you agreed to follow my travel blog on crossing the US by car, I clicked to return the favor and see yours as well. To my delight I see you sing classically, one of my great interests. Our daughter will be studying for her masters in classical vocal performance. All the best to you, and I hope to read more about your blossoming career! Hello Cal, road trips in the UK are getting expensive, petrol here costs £1.45 ( $ 2.25 ) per litre, or approx. £7.20 ( $ 11.18 ) per gallon, but I’d love to explore the whole of the UK on a road trip. What a lovely coincidence that your daughter is also a singer does she blog? Hope you get the chance to pop back from time to time. I would love to go to one of your concerts, but unfortunately I live in a different country… hope it goes well! Hi Stephanie, I’ll try to post another video this week, Gill kindly offered to video the concert today so I’ll have to see how it turned out. This concert sounds like a great success already. I wish I could have been there, you’ll be fine. About leaving your family, I know that can be tough. I know you’ll make out well. Thank you, also, for stopping by my blog and following it, yours is absolutely interesting also.